Wilmington, NC, February 14, 2018 — Two established Wilmington public relations practitioners are joining forces to open Fluent PR. 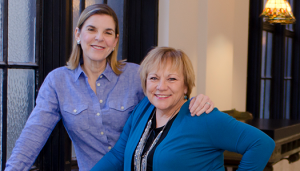 Ann Revell-Pechar and Margee Herring, APR, have worked independently serving clients throughout the Carolinas and across the globe for a combined 60 years. The team is co-located with Elite Innovations in the Murchison Building downtown, highlighting their commitment to promoting entrepreneurship and building Wilmington companies of all sizes. Revell-Pechar and Herring have formed a firm rooted in the public relations discipline, with a focus on media relations, product launch, content and digital media, strategic influencer engagement and communications strategy. Additional client offerings include event management, digital media, public speaking training and even podcasting, drawing on Revell-Pechar’s previous company, Business RadioX. The two have been considering a partnership since meeting in the founding workgroup of Cucalorus Connect in 2014, where Margee Herring was the original Connect Conference Coordinator. “Cucalorus Connect was essentially a PR platform for the City of Wilmington, and Ann and I saw that we shared a vision and enthusiasm for the business environment Wilmington is cultivating,” explains Herring. Though clients already draw from markets well beyond the Port City, Fluent PR looks to provide local enterprises a national platform, and in so doing spotlight Wilmington’s developing business and startup climate. A.Revell Communications’ client history has focused on entrepreneurship, technology, life sciences, clean tech and venture capital industries. Margee Herring PR has served corporate and Fortune 500, small business, real estate, higher education, special event and non-profit sectors. Herring brings to the practice River Place, Wilmington’s flagship development on the Cape Fear River, and Atlantic Neurosurgical & Spine Associates, a practice that leads the country in state-of-the-art robotic-assisted spinal fusions and in stroke/aneurysm response. Revell-Pechar brings, among others, Seattle client ZOIC Capital, a health care and life sciences venture capital firm. While additional client announcements are forthcoming, Fluent PR currently serves Wilmington start-ups Vavaroom, an online interior design service, myBeeHyve, a Software as a Service company for the network marketing industry, and Blaze Advisors, a healthcare consulting company. Headquartered in Wilmington, NC, Fluent PR represents businesses looking to establish a strong and positive reputation, locally and nationally. With combined communications experience totaling more than 60 years, the firm brings strategic understanding to a “marketing department down the hall” service delivery commitment. They can be found in downtown Wilmington at 201 North Front Street on the mezzanine level overlooking the inspiring Cape Fear River, or socially on Twitter, Facebook, LinkedIn and by phone at 910-319-4131.